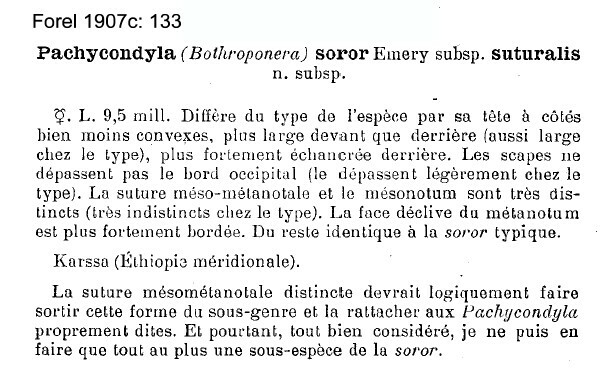 Type location Cameroun (Ponera (Bothroponera) soror n. sp., Emery, 1899e: 472, worker & queen; Menozzi, 1944, male; new status Schmidt & Shattuck, 2014: 77) collected by Conradt - see below. ancilla (Ponera (Bothroponera) soror var. ancilla n. var., Emery, 1899e: 472, worker) from Congo, River Kuilu, collector? - no images on Antweb (June 2014). suturalis (Pachycondyla (Bothroponera) soror Emery subsp. suturalis n. subsp., Forel, 1907c: 133, worker) from Ethiopia, Karssa - no images on Antweb (June 2014). Emery's (1899e) description is at . Arnold (1915) gave a translation, this is at . 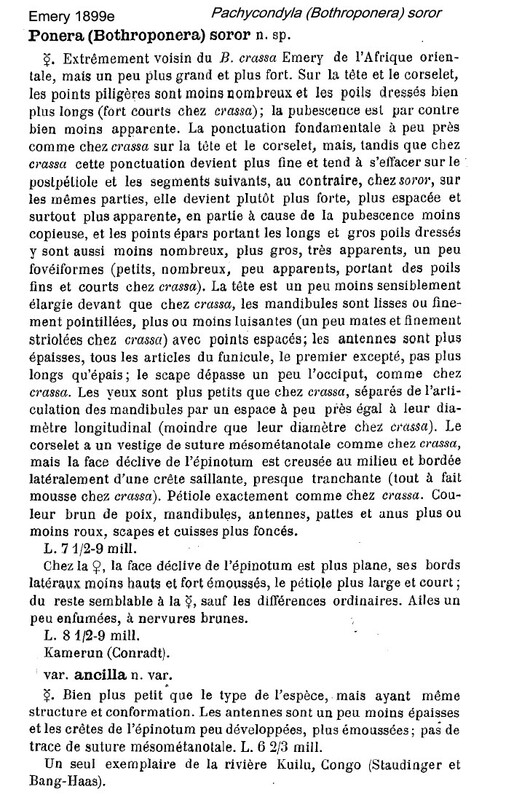 Forel's (1907c) description of suturalis is at . TL 8.00 (Ghana), TL 7.0-7.2 mm, HL 1.5, HW 1.35 (Guinea, Bernard, 1952; in my guide as Bothroponera soror). Similar colouration and sculpturation to P. silvestrii but significantly larger. Bernard (1952) noted colour black but with weak bronze reflections. Head and body with fine shagreening. Head with parallel sides, widest from the eyes back. Eye with 130-140 facets (ommatidia) cf 180 for lamottei (for comparative illustration go to Pachycondyla lamottei). Clypeus brown-red, little or no striation, with a medial lobe which is feebly concave anteriorly. Wheeler (1922) had other records from Togo (Bismarckburg, Conradt) and Cameroun (Metit, G. Schwab; Mundame, Conradt; Yaoundé, Zenker) plus eastwards to Zimbabwe. Mr. Lang found the workers crawling on tree trunks and noted that "when crushed, they gave off a stench reminding one of a bug" (presumably he meant a shield bug). Examined specimen from Ghana, no location. Also found in Ghana cocoa leaf litter and nesting in dead wood on the ground under cocoa at the Mampong Cemetery farm (Room, 1971). Single workers were found by Belshaw & Bolton (1994b) in a leaf litter sample from cocoa at Kade and secondary forest at Bunso. 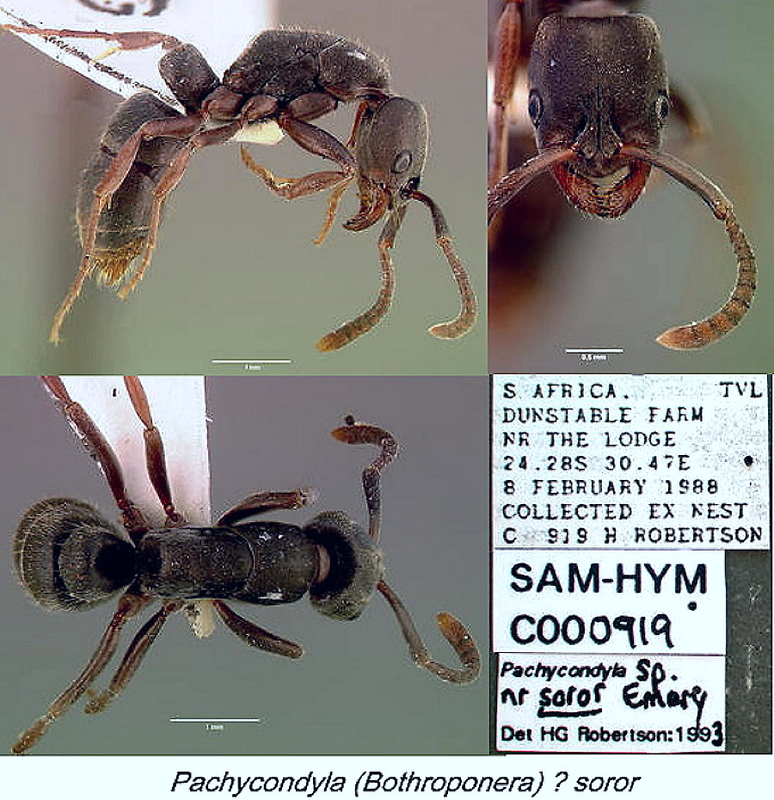 Bernard (1952) described this species (as Bothroponera soror) as widespread throughout Africa, except the North-East. In Guinea numerous specimens were found of this the most common "Bothroponera" occurring throughout the high elevations (primary forest and the crests, at 1100-1600 m); one is illustrated left (scan of photocopied photo). In Nigeria, its biology and use of chemicals was studied at Mokwa by Longhurst et al. (1980). Nest founding and queen behaviour was investigated in Zaïre by Haskins (1941). 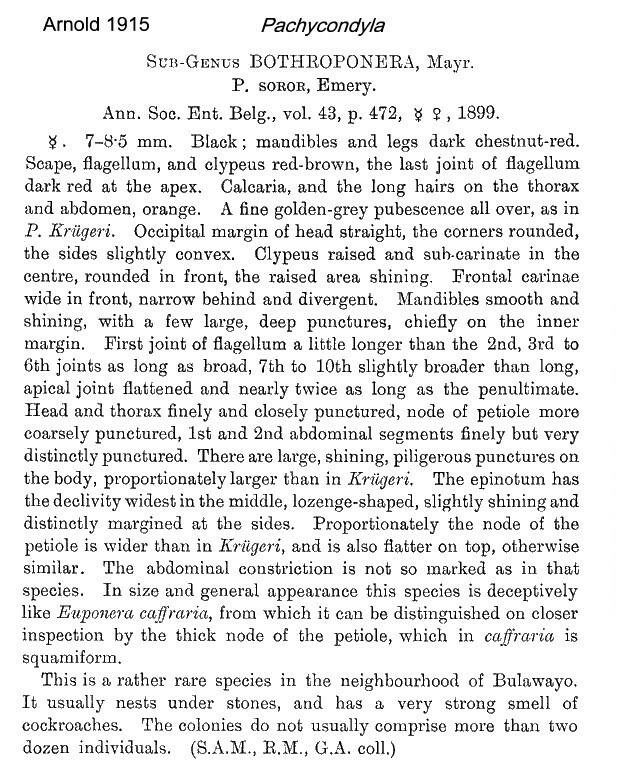 He described the species as fairly common, though locally distributed in the Congo rain forest to which it was largely confined. Further, he wrote that it nests by preference in the soil about decaying wet logs in the deeper forest, frequently running its galleries well into the wood. The young females foraged actively to feed their first brood larvae and this activity lapsed once workers commenced foraging. Its use of a mandibular gland secretion to attract other workers to prey was described by Longhurst et al. (1980). The photomontage of the type worker is collated from http://www.antweb.org/specimen.do?name=rmcaent000017726. The photomontage is of a specimen collected in Cameroun - south-western tropical coastal forest area between Edéa and Campo (McKey Wolbachia project, Cameroon 57). The erect setae at least reflect light to appear orange-brown, mandibles and extremities also this colour. The photomontage is of a specimen from Gabon, Pongara National Park, Point Wingombé; collector Yves Braet (Gabon 50). The photomontage is of a worker from Cameroun; Nko'ondo; aphid survey; collector A Fotso Kuate (fk unmounted 52). The photomontage is collated from http://www.antweb.org/specimen.do?name=sam-hym-c000919a&shot=p1&project=. Habitat: woodland The small size, TL ca 6.5mm, and near absence of hair pits on the head and petiole, suggest Robertson's label is correct and that this may well be a distinct species.